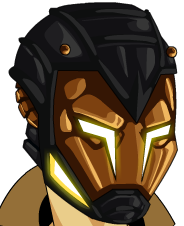 Description: This stark helm will terrorize your opponents when they try to stare you down. NO ONE outmatches an Iron Warrior! This item is a parody of Iron Man 3.